I saw this salad on my instagram's friend @venera_cher, and I just had to ask her for the recipe. She said that the recipe has been in her family for 80 years, from her great grandmother in Belarus. I made it right away, and we love it. It is delicious, crisp and fresh. I love that it keeps in the fridge for days. -Cut the cabbage into small chunks. Peel, half and slice beets. Slice all of the garlic cloves. -In a medium sized pot, bring water, vinegar, sugar, salt, veg oil, peppercorns and bay leaves to a boil. -In a large bowl, layer 1/3 of the cut cabbage, followed with 1/3 of the beets and 1/3 of the garlic. repeat again until all of the vegetables are used. 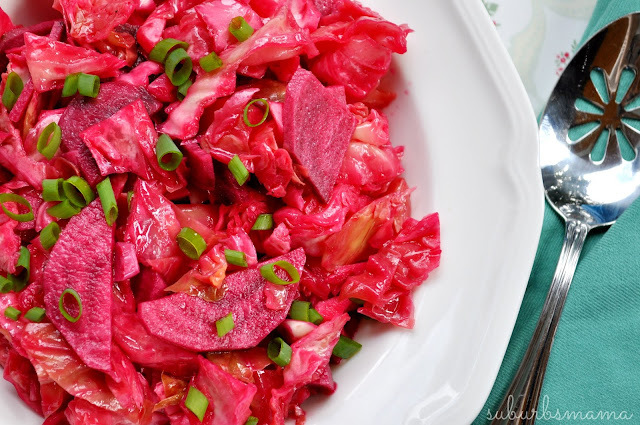 -Pour boiled marinade over the cabbage. Weigh the cabbage down into the liquid with a heavy plate in the bowl. Refrigerate for at least 24 hours before eating. -The longer you refrigerate it, the pinker the cabbage will turn. I think it is perfect 48 hours after making. 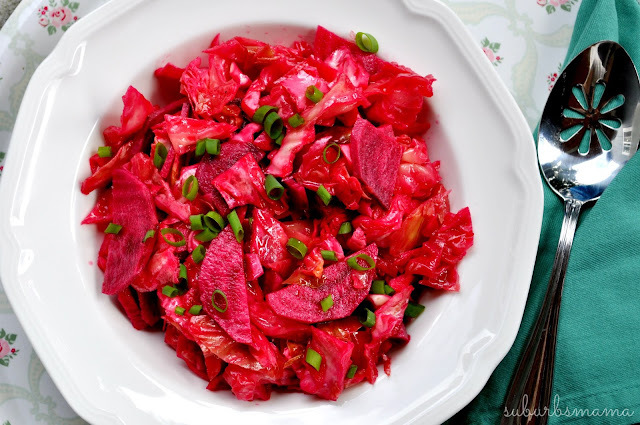 -You can serve as a side dish, I use a slotted spoon to scoop up all of the cabbage/beets.